For nearly two decades, the Japanese ensemble Kodo has twisted, shaped, and experimented with the traditional drum art "Taiko." 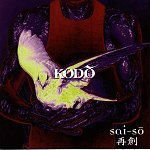 And with 1997's release of Ibuki, their fourth U.S. release, Kodo created an album that notables like Bill Laswell, DJ Krush, Strobe, Kevin Yost, Inteligente, David Beal, David Baron, Lindsay Jehan, and Kasz decided they could interpret in a different light. Thus the birth of Sai-So (Reborn): The Remix Project. Sai-So is a combination of Taiko, electronica, hip-hop, dance, and other technology-enhanced musical art forms. The album is a long roller coaster ride of intricate percussion, breakbeats, and an intense fire that burns deep into every song. Unfortunately though, I wasn't able to get into the album. It had a very persuasive, melodic tone to it, but the songs just seemed to ride on and on with a familiar beat, exploiting it until the corpse could be killed no longer, and then dropping another beat to toy around with until it too couldn't be killed anymore. The delicacy and passion that went into the album, I can respect that, and due, but it just seemed like one long-winded musical journey that started and ended on the same level, never really stepping outside it's own, self-created boundaries. I'll give it a C.